Hungry? We’ve Got You Covered. 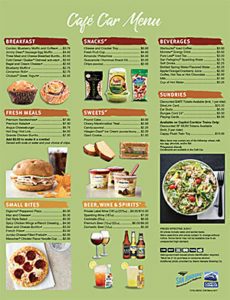 The Café Car is featuring new premium sandwiches, salads and more. And don’t forget to check out our list of local, domestic, and imported beer, wine and cocktails. Visit our on-board Café Car and ask about our daily features. We also carry Clipper Cards and SF MUNI tokens for sale. Food and beverages may be purchased on-board and consumed in the Café Car or at your seat. The Café Car accepts cash and most major credit cards. The Café Car is generally located on the upper level in the middle of the train, though some trains may have a lower-level Café Car. If you’re on a train with a lower-level Café Car, look for “California Café” signs near the stairwell. You may bring your own food on-board and consume it at your seat. However, per health and safety regulations, preparation and consumption of personal food is not permitted in the Café Car. Alcoholic beverages may be consumed on-board only if purchased in the Café Car. Consumption of personal alcohol is not permitted on-board. You are welcome to bring your own food onboard; however, you cannot consume your food in the Café Car. Amtrak staff cannot heat up or prepare any food you bring onboard. The food preparation equipment in the Café Car can only be used for food purchased onboard our trains. Amtrak prohibits passengers from bringing alcohol aboard trains for consumption purposes. Alcoholic beverages may be consumed onboard ONLY if purchased in the Café Car. Please also note that the purchase of discounted BART tickets from the Café Car is limited to one (1) BART ticket per ticketed passenger. Passengers may be asked to show Café Car attendant ticket stubs. Please note: Effective June 20, 2016, the Capitol Corridor will suspend Café Car service on two weekday evening trains – Train 549 and Train 550. Train 550 provides service from Oakland Coliseum to Sacramento, departing Oakland at 10:00pm. Train 549 provides service between Sacramento and Oakland Coliseum, departing Sacramento at 6:55pm. This change is required to reduce costs associated with providing food service on certain off-peak trains. *Selections and prices subject to change without notice. Find your new favorite menu item.